If you install Windows 7 on a clean disk with no existing partitions, it creates a System Reserved partition at the beginning of the disk and uses the remainder of the unallocated space to create your system drive.That small partition isn’t assigned a drive letter, so you won’t even know it exists unless you look in the Disk Management console or use a low-level utility, such as Diskpart, to inspect the disk structure. 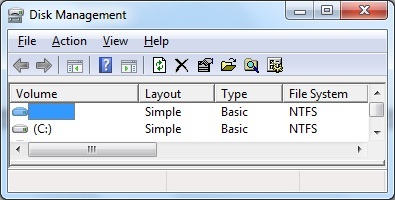 This “stub” of a partition, which is new in Windows 7, serves two functions. First, it holds the Boot Manager code and the Boot Configuration Database. Sec¬ond, it reserves space for the startup files required by the BitLocker Drive Encryption feature. If you ever decide to encrypt your system drive using BitLocker, you won’t have to repartition your system drive to make it possible. If you’re confident you’ll never use BitLocker and prefer to do without the additional complexity of this System Reserved partition, your best bet is to make sure it’s never created. For a truly clean installation starting from an unformatted hard drive, you must use a different disk-management utility, such as the setup disk available from many hard-disk manufacturers or a startup disk from Windows Vista. Create a single primary partition using all unallocated space, and then point the installer to the newly created partition as the setup location. (Note that you cannot use the graphical disk-management tools available from the Windows 7 DVD to perform this task.) After you use the alternative tool to create a partition on the drive, you can point the Win¬dows 7 installer to that location and it will proceed. Tip adapted from Windows 7 Inside Out by Ed Bott, Carl Siechert, and Craig Stinson.